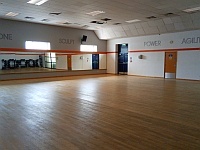 Services / facilities within the building include a sports hall, fitness suite, dance studio, spinning room, leisure and main pools, health suite and a cafe. Please contact the venue for details of opening times and opening times do vary depending on timetabling. Last admission is one hour before closing. The nearest mainline station is Glasgow Central. The nearest underground station is Bridge Street. 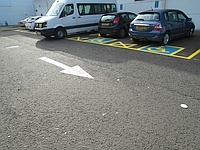 The dimensions of the Blue Badge parking bay(s) are 360cm x 480cm (11ft 10in x 15ft 9in). The nearest Blue Badge bay is 16m (17yd 1ft) from the main entrance. 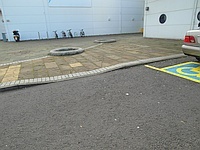 The furthest Blue Badge bay is 30m (32yd 2ft) from the main entrance. 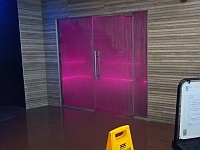 The automatic doors are push pad operated. 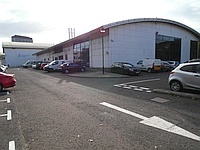 You are on Outside Access (Ballater Street Entrance). Skip to the next section. This information is for the entrance located on Ballater Street. The width of the door opening is 165cm (5ft 5in). 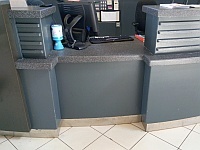 The desk/counter is 5m (5yd 1ft) from the main entrance. 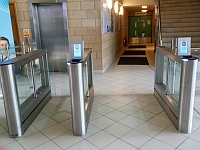 There are security gates at reception to access the building. 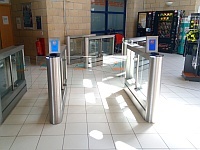 The opening width of the security gates range from 90cm to 120cm. Music is played in the public areas. 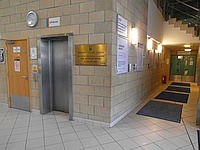 The lift is located opposite reception. 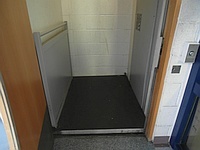 The lift is approximately 5m (5yd 1ft) from the main entrance. The clear door width is 80cm (2ft 7in). The dimensions of the lift are 103cm x 140cm (3ft 5in x 4ft 7in). You are on Other Floors (Gallery). Skip to the next section. 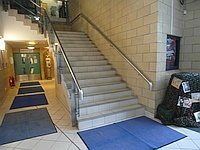 The floors which are accessible by stairs are Ground-Tennis Gallery. 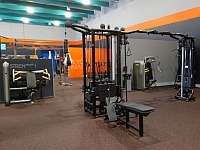 You are on Lift (Gallery). Skip to the next section. 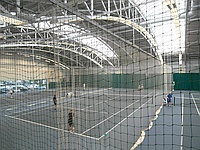 The lift is located at the rear of the tennis courts. 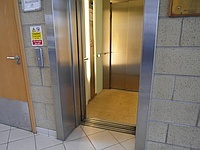 The floors which are accessible by this lift are Ground- Tennis Gallery. The lift is approximately 36m (39yd 1ft) from the main entrance. The clear door width is 96cm (3ft 2in). The dimensions of the lift are 106cm x 140cm (3ft 6in x 4ft 7in). The lighting level in the lift is low. You are on Eating and Drinking (Encore). Skip to the next section. 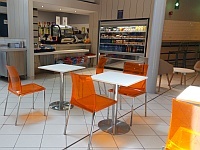 The café is located across from reception. The distance between the floor and the lowest table is 45cm (1ft 6in). 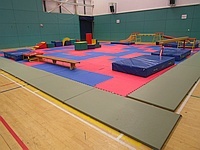 The distance between the floor and the highest table is 107cm (3ft 6in). 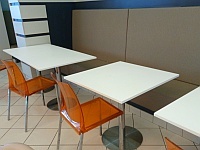 The standard height for tables is 71cm. 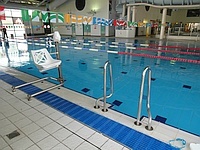 You are on Swimming Pool (Main Pool). Skip to the next section. 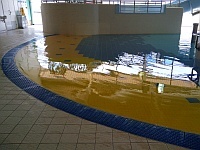 There is level access from the changing area to the swimming pool. There is not a ramped entrance into the water. There is a wet side chair available. 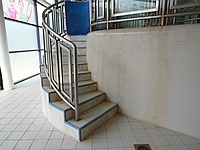 There is a hoist for wheelchair users to access the water. There are not steps into the swimming pool. There is a ladder type entrance into the water. There is a handrail on both sides of the ladder. You are on Swimming Pool (Leisure Pool). Skip to the next section. There is a ramped entrance into the water. 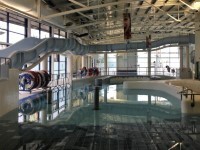 The hoist can be used to access the jacuzzi area. 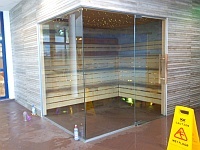 There is level access to the sauna and steam room. You are on Level Change (Flumes). Skip to the next section. The step(s) is/are located leading up to the flumes. This is a sprial staircase. There are 9 clearly marked steps back down from the flumes pool with a handrail on the right coming down. 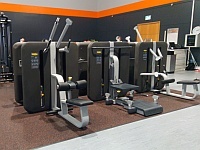 You are on Fitness Suite. Skip to the next section. 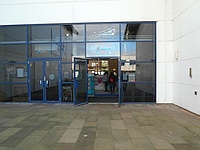 The fitness suite is located to the left as you enter. 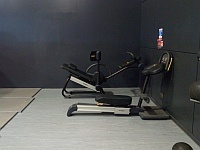 The fitness suite is 33m (36yd 3in) from the main entrance. 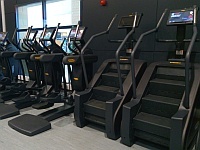 There is level access to the fitness suite. 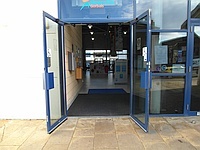 There are doors into the fitness suite. The opening is 146cm (4ft 9in) wide. Staff receive some training in assisting disabled people. 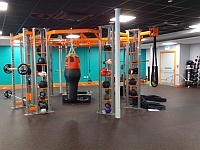 Equipment suitable for mobility or sensory impaired users includes weight lifting equipment and tactile controls on some electronic machines. A portable hearing loop is available for induction. Staff are trained to use the portable hearing loop. 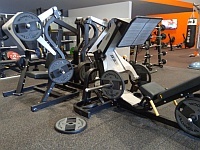 There is clear manoeuvring space between equipment. 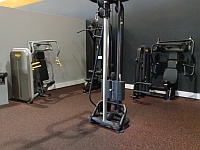 There is level access to all of the equipment. 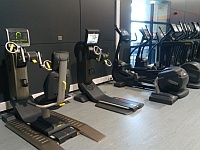 There is further gym equipment available to the left from the lift on the first floor (shown in photographs 9 and 10). You are on Accessible Toilet (Dry Side). Skip to the next section. 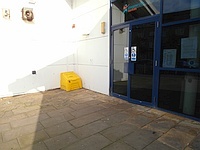 This accessible toilet is approximately 24m (26yd 9in) from the main entrance. 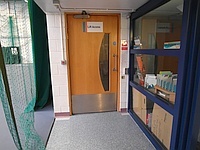 This accessible toilet is located in the main corridor opposite the sports hall. 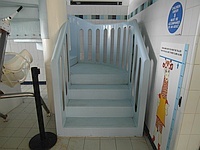 The dimensions of the accessible toilet are 248cm x 220cm (8ft 2in x 7ft 3in). 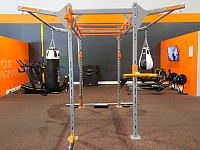 The lateral transfer space is 120cm (3ft 11in). 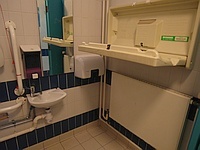 There is a peninsular accessible toilet available on the first floor. You are on Accessible Shower (Dry Side). Skip to the next section. Accessible shower facilities are available. 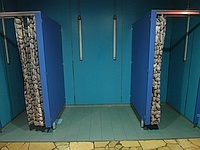 The accessible shower(s) surveyed is/are located within the accessible toilet. 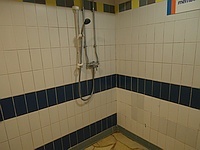 The facilities available in the accessible shower(s) include; an adjustable shower head and a flip down seat. 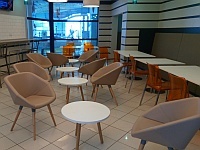 The height of the seat is 52cm (1ft 8in). 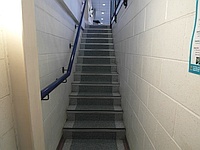 Other facilities available include; accessible toilet. 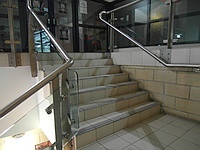 There is level access to the services from the accessible shower facilities. 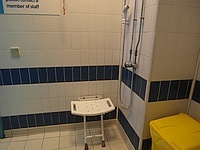 There is a similar accessible shower in the 1st floor health suite accessible toilet offering a shower chair. You are on Standard Changing Room (Dry Side). Skip to the next section. There is a/are standard changing room(s) available. 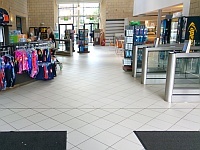 The standard changing room(s) is/are approximately 22m (24yd 2in) from the main entrance. 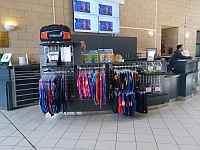 The standard changing room(s) is/are approximately 17m (18yd 1ft) from the reception desk. 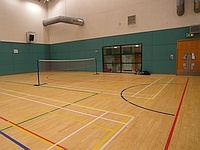 The standard changing room(s) is/are approximately 4m (4yd 1ft) from the sports hall. 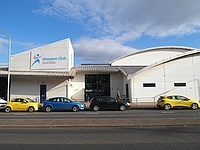 The standard changing room(s) surveyed is/are located opposite the sports hall. 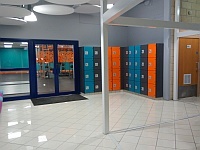 There is level access to the standard changing room(s). 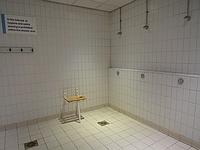 Shower facilities are available within the changing room(s). 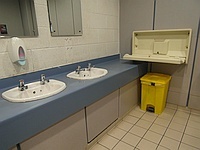 There are similar changing facilities in the 1st floor health suite. You are on Accessible Changing Room (Wet Side). Skip to the next section. There are accessible changing rooms available. 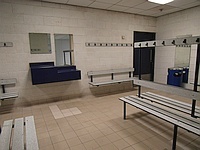 The accessible changing room is located in the changing village. 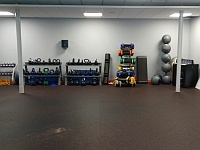 The facility is 29m (31yd 2ft) from the main entrance. The width of the door is 82cm (2ft 8in). 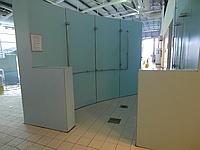 The dimensions of the accessible changing room are 476cm x 300cm (15ft 7in x 9ft 10in). There is not a locker within the accessible changing room. The accessible changing room has a manual hoist. There is a changing bench. 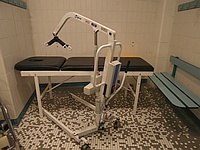 The facility changing bench is free standing. The facility changing bench height is fixed. The length of the bench is 180cm (5ft 11in). There is not a wheel in shower. There is also a changing bench in the poolside first aid room. 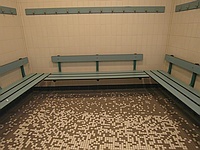 There is a larger changing room with a changing seat which offers grab rails in the changing village. You are on Accessible Toilet (Wet Side). Skip to the next section. 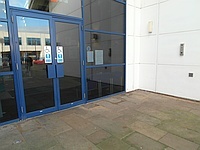 This accessible toilet is approximately 14m (15yd 11in) from the main entrance. This accessible toilet is located within the changing area. The door opens by sliding (Bi-Fold). 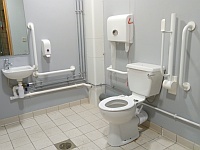 The dimensions of the accessible toilet are 199cm x 230cm (6ft 6in x 7ft 7in). 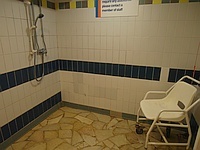 You are on Accessible Shower (Wet Side). Skip to the next section. 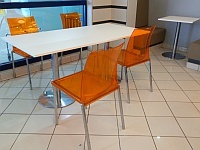 The height of the seat is 54cm (1ft 9in). You are on Standard Changing Room (Wet Side). Skip to the next section. 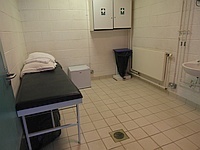 The standard changing room(s) is/are approximately 11m (12yd 1in) from the main entrance. 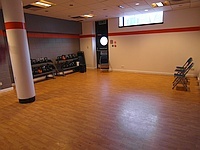 The standard changing room(s) is/are approximately 12m (13yd 4in) from the reception desk. 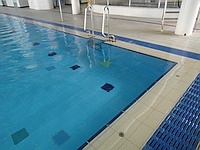 The standard changing room(s) is/are approximately 4m (4yd 1ft) from the pool. 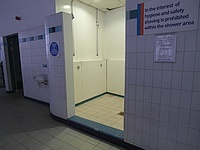 The standard changing room(s) surveyed is/are located opposite reception. Some of the showers have 1 medium step to access. 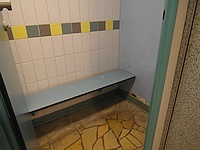 The female and male toilet facilities that were surveyed are located within the changing areas. 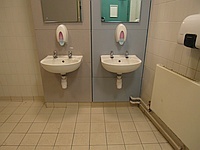 The female and male toilets are approximately 20m (21yd 2ft) from the main entrance. Baby change facilities are located within the standard toilets. The height of the baby change table once extended is 80cm (2ft 7in). 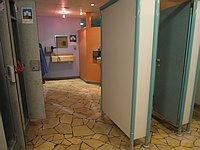 Further standard toilets and baby change facilities are available throughout the venue in changing areas.